Kimmyz on Greenway–the Way to Party with FJB! | Faded Jeans – Arizona's Party Band! 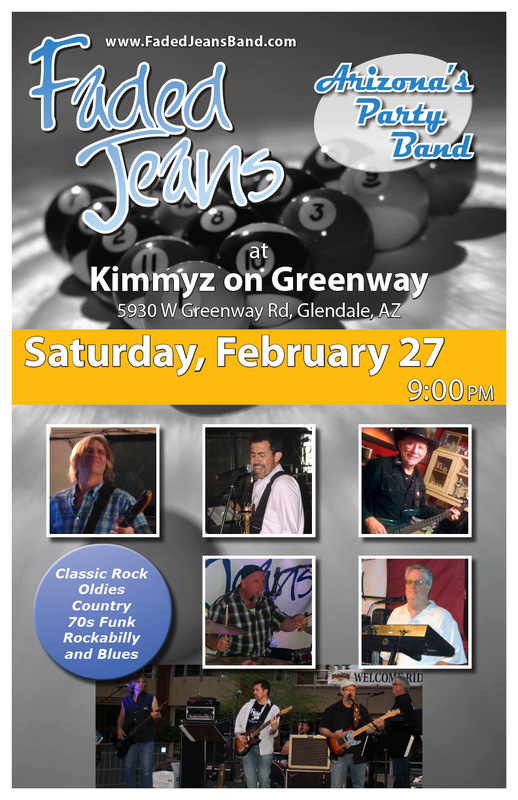 Kimmyz on Greenway–the Way to Party with FJB! Click on this poster and share it with your friends! We would love to have some more raw material for our next fan-sourced compilation on YouTube. Be sure to tap the camera icon on your phone, snap some shots, and share your photos and videos of us rockin’ the house! You are our best camera men and women … and what better way to show off that fancy smartphone? Faded Jeans logo shirts are available at all FJB shows while supplies last. Grab one for only $20, or two for $30! Of course, once you have one, don’t forget to show it off … just share a photo of you in your FJB shirt and we’ll add it to the collection on our Facebook page! Check the CALENDAR on our site. Are you interested in booking Faded Jeans for your next special event? CONTACT US now! If you’d like to help spread the word about this or any of the upcoming shows, feel free to forward this info to your friends and neighbors throughout the valley. P.S. If you haven’t already, hook up with Faded Jeans on Facebook … and Twitter … thanks!